Do we identify more with being a democrat or a republican than being a disciple of Christ? In Mark 8:5, Jesus cautioned us, saying, “Watch out; beware of the leaven of the Pharisees and the leaven of Herod” who represented both the politically correct religion and the politicians of Jesus’ day. )”Leaven” is a pervasive influence that modifies and transforms our view of things. 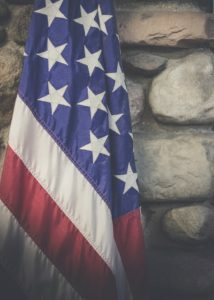 If we were to remove the leaven of the label Democrat, Republican, conservative, libertarian or any other political identifier from in front of the name of a public figure, would we discern that that person is advocating for policies that support or violate the word of God? Hamilton was saying that as Americans we need to beware how people will come claiming to support our civil liberties by advocating for a narrow constituency in ways that will pit US against one another. Hamilton called these tactics “gloomy sophisms”, meaning fallacious arguments that are used deliberately to deceive US. Today we hear gloomy sophisms from partisan political doom sayers all the time. Instead of quoting scripture to compel us to love one another, they continually tell us how other people are out to get us because we are black or homosexual or female. Instead of teaching God’s love and Word, which lifts us up in liberty, they cry “separation of church and state,” which is a way of saying “What God says in scripture has no relevance or value here.” Yet we as believers know that God sent Christ as the Savior of the world, because He vitally is concerned with all human affairs, our well-being and how we live. So, today, I ask, are we living as Democrats or Republicans, or conservatives or libertarians or some other political identifier that factionalizes us for someone’s political purpose, or are we living as people who love God most and our neighbors as ourselves? Are we faith-filled people who are believing God’s best for each other? Or are we factionalized into political hate groups that slander and name call those we perceive to be on the other side? “Do we love God and identify with Him and are more loyal to His Word than we are to the various political parties with which we claim allegiance, and which vie for our attention? Are we being manipulated to violate God’s word by deceptive human political loyalties that are factions that separate us from the application of God’s truth to civic life? Or are we fulfilling The Greatest Commandment to love God most and love our neighbors, even those we perceive as enemies as ourselves? One enslaves us in personal and civic prisons of hate, while the other establishes us in God’s grace and blessing and lift us and our neighbors up in liberty.